Google in the coming weeks is expected to fix a location privacy leak in two of its most popular consumer products. New research shows that Web sites can run a simple script in the background that collects precise location data on people who have a Google Home or Chromecast device installed anywhere on their local network. Craig Young, a researcher with security firm Tripwire, said he discovered an authentication weakness that leaks incredibly accurate location information about users of both the smart speaker and home assistant Google Home, and Chromecast, a small electronic device that makes it simple to stream TV shows, movies and games to a digital television or monitor. Young said the attack works by asking the Google device for a list of nearby wireless networks and then sending that list to Google’s geolocation lookup services. It is common for Web sites to keep a record of the numeric Internet Protocol (IP) address of all visitors, and those addresses can be used in combination with online geolocation tools to glean information about each visitor’s hometown or region. But this type of location information is often quite imprecise. In many cases, IP geolocation offers only a general idea of where the IP address may be based geographically. This is typically not the case with Google’s geolocation data, which includes comprehensive maps of wireless network names around the world, linking each individual Wi-Fi network to a corresponding physical location. Armed with this data, Google can very often determine a user’s location to within a few feet (particularly in densely populated areas), by triangulating the user between several nearby mapped Wi-Fi access points. [Side note: Anyone who’d like to see this in action need only to turn off location data and remove the SIM card from a smart phone and see how well navigation apps like Google’s Waze can still figure out where you are]. Young said a demo he created (a video of which is below) is accurate enough that he can tell roughly how far apart his device in the kitchen is from another device in the basement. Beyond leaking a Chromecast or Google Home user’s precise geographic location, this bug could help scammers make phishing and extortion attacks appear more realistic. Common scams like fake FBI or IRS warnings or threats to release compromising photos or expose some secret to friends and family could abuse Google’s location data to lend credibility to the fake warnings, Young notes. When Young first reached out to Google in May about his findings, the company replied by closing his bug report with a “Status: Won’t Fix (Intended Behavior)” message. But after being contacted by KrebsOnSecurity, Google changed its tune, saying it planned to ship an update to address the privacy leak in both devices. Currently, that update is slated to be released in mid-July 2018. 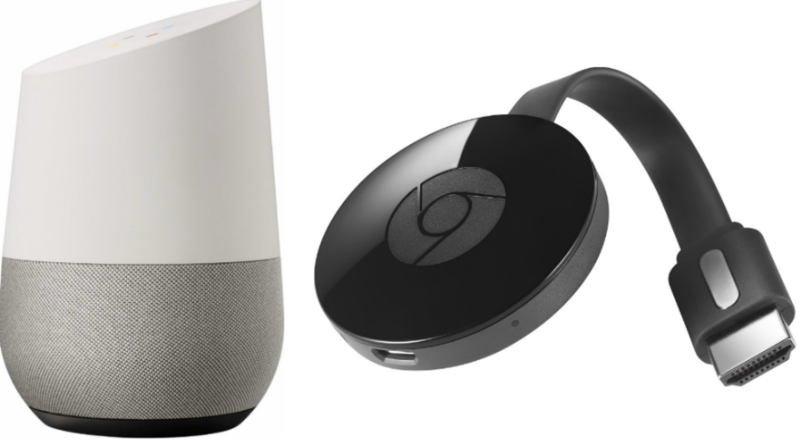 According to Tripwire, the location data leak stems from poor authentication by Google Home and Chromecast devices, which rarely require authentication for connections received on a local network. Earlier this year, KrebsOnSecurity posted some basic rules for securing your various “Internet of Things” (IoT) devices. That primer lacked one piece of advice that is a bit more technical but which can help mitigate security or privacy issues that come with using IoT systems: Creating your own “Intranet of Things,” by segregating IoT devices from the rest of your local network so that they reside on a completely different network from the devices you use to browse the Internet and store files. For more on setting up a multi-router solution to mitigating threats from IoT devices, check out this in-depth post on the subject from security researcher and blogger Steve Gibson. This entry was posted on Monday, June 18th, 2018 at 10:04 am	and is filed under Latest Warnings.